In 1928, the Kansas City Star newspaper printed its first quilt block pattern, and they continued this tradition for 34 wonderful years. Now, the best of the blocks from each year can be found in one place! 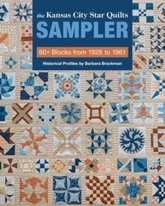 Beloved author and quilt historian Barbara Brackman presents stories of America’s quilting past. More importantly perhaps, she presents over 60 blocks from the first half of the 20th century. Stitch them all and create a sampler quilt that’s one gorgeous slice of Americana. These beautiful blocks span a wide range of skill levels and are great for playing a bit of mix and match with. There are photos of finished quilts and instructions for the stunning sampler that provides a setting for all of the blocks.